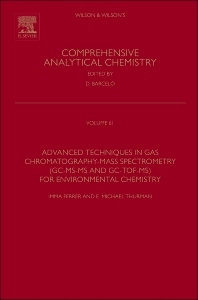 Gas chromatography mass spectrometry (GC-MS) has been the technique of choice of analytical scientists for many years. The latest developments in instrumentation, including tandem mass spectrometry (MS-MS) and time-of-flight (TOF) detectors, have opened up and broadened the scope of environmental analytical chemistry. This book summarizes the major advances and relevant applications of GC-MS techniques over the last 10 years, with chapters by leading authors in the field of environmental chemistry. The authors are drawn from academia, industry and government. The book is organized in three main parts. Part I covers applications of basic GC-MS to solve environmental-related problems. Part II focuses on GC-MS-MS instrumentation for the analyses of a broad range of analysis in environmental samples (pesticides, persistent organic pollutants, endocrine disruptors, etc.). Part III covers the use of more advanced GC-MS techniques using low- and high-resolution mass spectrometry for many applications related to the environment, food and industry.